It’s hard to calculate a recommended list of songs from a band that steered the course of your adolescence. Even more difficult is when the captain of that ship also served as the gateway into a lifelong enjoyment of the genre that most represents your preferred musical interests. 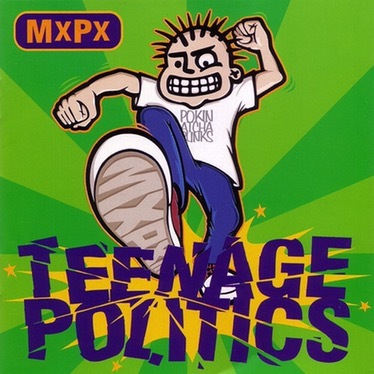 As a teenager I discovered mxpx while shopping with my mother at the local Christian bookstore. I chose to purchase something off-the-cuff and stylistically unique to what I had previously been known to consume. The carefully considered purchase was driven by the overly caricatured figure smashing the phrase “TEENAGE POLITICS” with the sole of his sneaker in the shape of the name of the band. It immediately caught my attention and I picked Teenage Politics up off the shelf while I placed my bets within myself. The album cover called the band mxpx while the spine of the CD named them magnified plaid. There wasn’t much more consideration needed to help convince me that I was going to spend $16.99 on an album from a band that I knew nothing about. Paper route tip money well spent. I played that CD over and over again in my room. I could not yet drive. I had nowhere to go. I was 15 years old and Teenage Politics had hijacked my adolescence.